Following its victory in the Russo-Japanese War in 1905, Japan occupied Korea; five years later it formally annexed the entire peninsula. After World War II, a republic was set up in the southern half of the Korean Peninsula while a Communist-style government was installed in the north. During the Korean War (1950-1953), US and other UN forces intervened to defend South Korea from North Korean attacks supported by the Chinese. An armistice was signed in 1953, splitting the peninsula along a demilitarized zone at about the 38th parallel. Thereafter, South Korea achieved rapid economic growth with per capita income rising to roughly 18 times the level of North Korea. South Korea has maintained its commitment to democratize its political processes. In June 2000, a historic first North-South summit took place between the South's President Kim Dae-jung and the North's leader Kim Chong-il. We are aware that there is friction between the North and South Koreans, and we presume that Kim Dae-jung is one of the good guys because only the good die young! South Korea issued a number of gold proof coins in 1970, with low mintages and correspondingly high catalogue values. 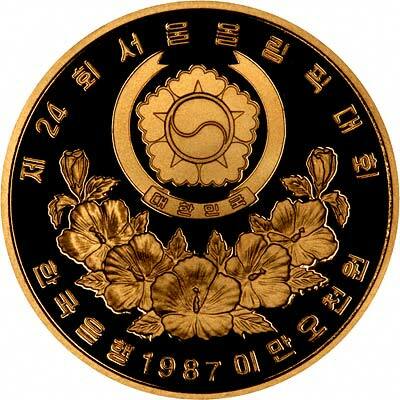 From 1986 to 1988, they issued a small series in uncirculated and proof versions with olympic themes to celebrate the Seoul Olympics held in 1988, and at least one subsequent issue. For some reason we see very few Korean gold coins. 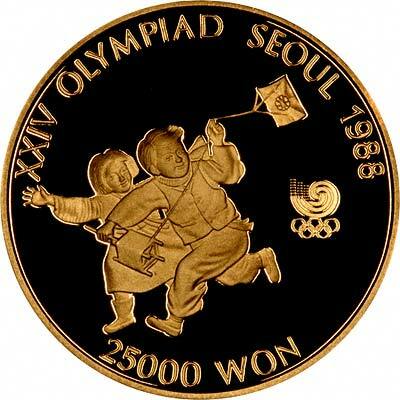 The gold coins South Korea issued to celebrate the Seoul Olympics comprise a series of four designs over three years, and five issues, because the "kite flying" design was issued during both 1987 and 1988. The coin shown in our photographs is a 1987 proof gold 25,000 Won which we think features very attractive designs on both sides. The reverse shows a young boy and girl running along and playing with a kite. One could be forgiven go thinking that kite flying was the national sport of South Korea, but apparently it is a form of wrestling called Ssireum. The other designs in the olympic series are Folk Dancing, Fan Dancing, and Korean Seesaw, none of which are olympic sports to the best of our knowledge. We are looking forward to acquiring more of the other Korean coins so that we can photograph them and add them to our website. PyeongChang won a resounding victory over rivals Germany's Munich and France's Annecy in an International Olympic Committee vote on Wednesday. For silver and base metal coins of South Korea, please look at our original Chard Coins website.